Are fracking and earthquakes really connected? Which American state has the most earthquakes? If you guessed Alaska or California, you might have been right — years ago. These days, the title goes to Oklahoma, where research links the oil and gas industry to the quakes. Oklahoma recorded 623 earthquakes of magnitude 3.0 or higher in 2016; throughout the 1990s, it felt only 16. The state’s largest-ever — a 5.8 magnitude quake felt from Chicago to Denver — hit in September 2016. By comparison, California experienced about 137 in 2016. Activists have blamed this spike in seismic activity on the controversial recent boom in hydraulic fracturing — or “fracking,” when fluids are injected at high pressure to fracture underground shale rock and create pathways for oil and gas to escape. But while scientists say fracking may be causing occasional quakes (and associate it with other malaises, often pollution-related), they largely agree that the technique itself is not responsible for a majority of these induced, or human-caused, earthquakes. Instead, a number of recent research papers suggest two other related procedures are largely responsible. The first is pumping waste liquids into the ground. Oil and gas drillers have long re-injected the salty water that naturally appears in oil deposits, explains a 2015 paper in Science Advances. Tens of thousands of wastewater wells are active in the United States, according to an exhaustive 2013 paper for the National Academy of Sciences, and oversight is limited. Wastewater disposal wells, for example, “normally do not have a detailed geologic review performed prior to injection, and the data are often not available to make such a detailed review. Thus, the location of possible nearby faults is often not a standard part” of setting up these disposal wells. The water is usually injected deeper into the earth, so as not to contaminate oil deposits, where it can add pressure to these unseen fault lines. Frequently this happens in conjunction with fracking. The second, carbon capture and storage (CCS), is a newer process that the Environmental Protection Agency champions as a green alternative to carbon emissions. Yet, as a 2016 paper for the Royal Society of Chemistry explains, CCS often uses a liquid to pump the captured carbon deep into the earth. The National Academy of Sciences paper adds that CCS has an even larger potential to induce seismic events than wastewater disposal because the volumes of injected fluids are theoretically larger, occurring over longer periods of time and under higher pressure. A 2016 presentation by Kayla Kroll of the Lawrence Livermore National Laboratory, which is operated by the Department of Energy, found the rate of injection — for any of these techniques — has an effect on the seismic events. Lower pressure results in more earthquakes but fewer large ones; periodically injecting at high rates, by contrast, results in fewer quakes but larger ones. 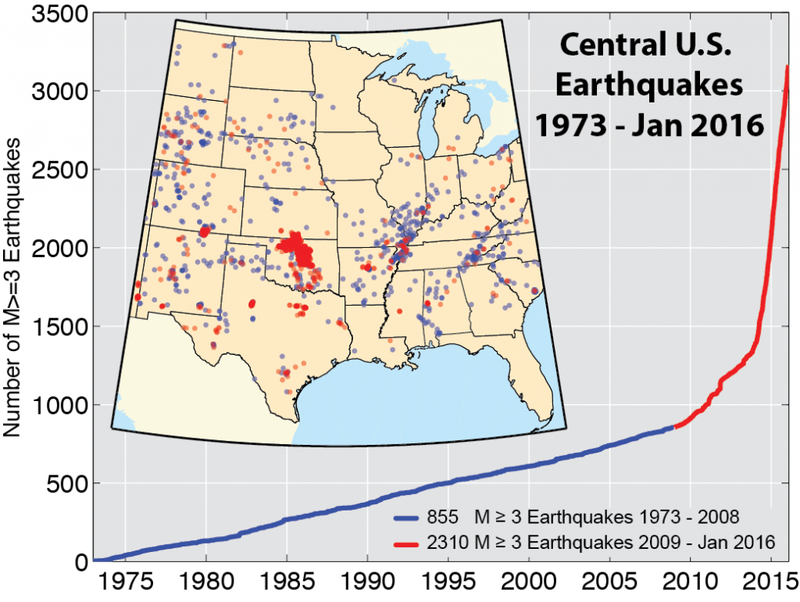 A 2015 paper in the Columbia Journal of Environmental Law looks at how legislation varies in different states and concludes that, in Oklahoma, “little law appears to deter operators from inducing earthquakes.” Texas is similar: “The fact that Texas common law only mildly deters operators from inducing earthquakes through the diminished threat of liability under a mere negligence standard may account for the fact that Texas has experienced more induced earthquakes than any other state.” By contrast, Ohio and Colorado — two other states with active underground drilling — have established regulations forcing energy companies to use caution. The U.S. Geological Survey (USGS) at the Department of the Interior should be a first stop for anyone interested in the latest earthquake research and data. It has maps of potential earthquake zones, up-to-the-hour data on the most recent earthquakes around the world, fact sheets on human-caused earthquakes and lists of recent research on induced seismicity. USGS also explains the link between wastewater disposals and induced earthquakes in a “myths and misconceptions” page. The Oklahoma Geological Survey has similar resources focused specifically on the state and what authorities are doing about the sudden spate of quakes there. The Oklahoma Corporation Commission, which regulates the oil and gas industry in the state, addresses the problem on its website. The Energy Information Agency, an independent research outfit at the U.S. Department of Energy, has fact pages on global oil and natural gas production, as well as vast troves of data on just about every energy angle imaginable. The UC Berkeley Seismology Lab has written about human-induced seismicity in the Midwest. 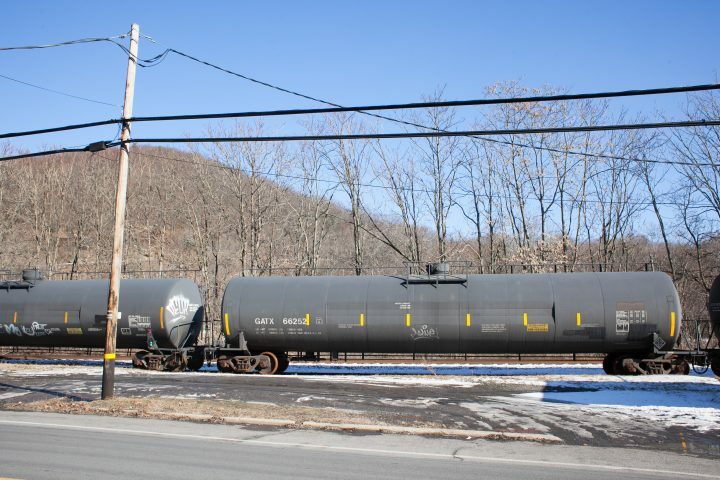 Journalist’s Resource has covered research on the health effects of the fracking boom and the costs to local infrastructure. Ellsworth, William L. “Injection-Induced Earthquakes.” Science, 2013. doi: 10.1126/science.1225942. Keranen, Katie M.; et al. “Potentially Induced Earthquakes in Oklahoma, USA: Links Between Wastewater Injection and the 2011 Mw 5.7 Earthquake Sequence.” Geology, 2013. doi: 10.1130/G34045. Petersen, Mark D.; et al. “2016 One-Year Seismic Hazard Forecast for the Central and Eastern United States from Induced and Natural Earthquakes.” United States Geological Survey, 2016. doi:10.3133/ofr20161035. Richards, Emery Gullickson. “Finding Fault: Induced Earthquake Liability and Regulation.” Columbia Journal of Environmental Law, 2015. Shirzaei, Manoochehr. “Surface Uplift and Time-Dependent Seismic Hazard Due to Fluid Injection in Eastern Texas.” Science, 2016. doi: 10.1126/science.aag0262. Smit, Berend. “Carbon Capture and Storage: Introductory Lecture.” Faraday Discussions, The Royal Society of Chemistry, 2016. doi: 10.1039/c6fd00148c. Verdon, James P. “Subsurface Fluid Injection and Induced Seismicity in Southeast Saskatchewan.” International Journal of Greenhouse Gas Control, 2016. doi: 10.1016/j.ijggc.2016.04.007. Walsh III, F. Rall; Zoback, Mark D. “Probabilistic Assessment of Potential Fault Slip Related to Injection-Induced Earthquakes: Application to North-Central Oklahoma, USA.” Geology, 2016. doi: 10.1130/G38275.1. Walsh III, F. Rall; Zoback, Mark D. “Oklahoma’s Recent Earthquakes and Saltwater Disposal.” Science Advances, 2015. doi: 10.1126/sciadv.1500195. Yeck, W. L.; et al. “Oklahoma Experiences Largest Earthquake During Ongoing Regional Wastewater Injection Hazard Mitigation Efforts.” Geophysical Research Letters, 2017. doi: 10.1002/2016GL071685.